We're hearing and seeing plenty about how VR is going to look better, sound better, feel better, but there's a much larger problem to overcome: how the hell do we maneuver in these virtual worlds? HTC and Valve went a short distance to solving that with room scale - Oculus too - but even then you're still restricted to a relatively small play space. And yeah, headsets like the Pico Goblin offer full untethered movement, but not with the high-end games you'll find on the aforementioned headsets. So understandably a lot of games to date have been very stationary or seated experiences, but new ideas are flowing at E3 2017, with interesting ways to let us traverse these VR worlds. The big name on the table is of course Bethesda, which announced a trio of games for virtual reality: Fallout 4 VR, Doom VFR and Skyrim VR. 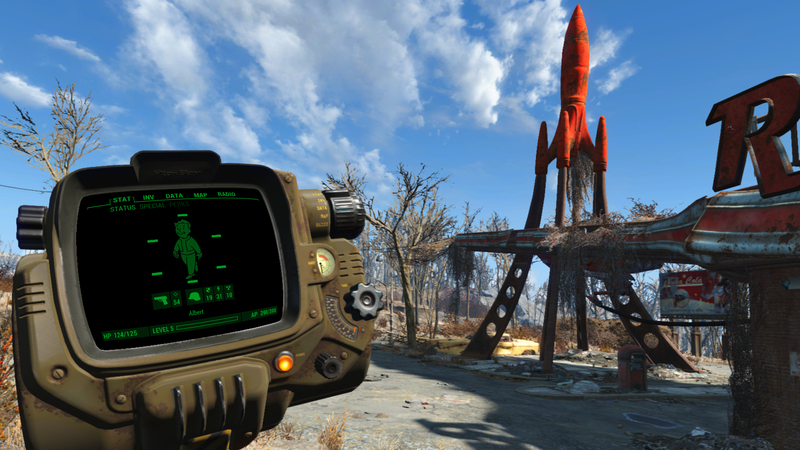 For Fallout and Skyrim, Bethesda has transported two huge open-world games into virtual reality. For Fallout 4 you've got two ways to move: a teleporting locomotion where you hold the touchpad and point a highlighted marker to where you want to travel; and a more traditional mode where you use the touchpad directionals. I went in skeptical, but the teleporting mechanic was much smoother and easier than I expected. And bonus: I didn't feel at risk of spewing all over the Bethesda reps.
For now, Skyrim is only coming to PS VR, which poses its own set of challenges as Sony's headset doesn't have full room-scale, and turning away from the camera can cause occlusion. For this, Bethesda's using a similar teleportation mechanic, but it's also adding quick-turn buttons for 360 movement. It's not quite as smooth, but it works well enough. While not perfect, Bethesda's ways of solving movement are serviceable, but other games are finding more unique ways to get around the problem. I also got to try Sprint Vector, a racing game that will be out later this year on Vive and the Oculus Rift. This one requires you to move the Vive wands in a sprinting motion in order to propel yourself through the course, which turned out to be a surprisingly intuitive way to travel. I could also climb walls, and even hold my hands out in front of me to fly like Superman when mid-air. After about 10 minutes it felt quite normal. Of course, VR requires rethinking how games are fundamentally designed, and in many cases we'll see games that center themselves around the movement mechanics. Take Lone Echo, for example. Here, you're in space, pulling and pushing yourself around in zero gravity. I got to demo the multiplayer mode, Echo Arena, where I played a competitive game of three-on-three space frisbee. It solves the movement problem by taking your legs out of the equation completely, although I did catch an unsettling glimpse of them floating about whenever I moved backwards. Arktika.1 was the most visually impressive game I've played at the show, but it relies on a teleporting mechanic that's more linear than Fallout 4, giving you just a few locations to pick from each time. It works, but it feels much more limiting and a bit on-the-rails. Movement in VR will continue to be one of the more problematic obstacles to overcome, but as E3 has shown, one of the most interesting. It feels like we're starting to get somewhere.